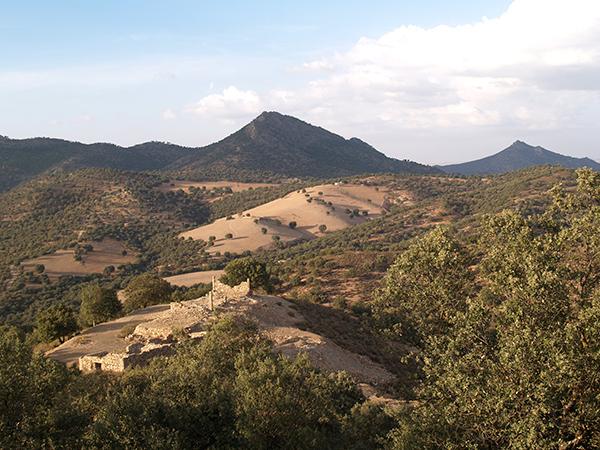 Morocco is well known as a mineral paradise. 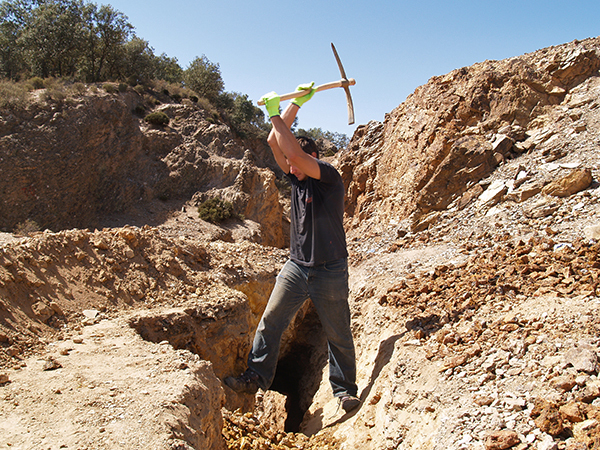 Due to a complex geological history the whole country is very rich in mineral deposits and mineralogical occurrences. Almost every year either new places are discovered, or the old once re-discovered. 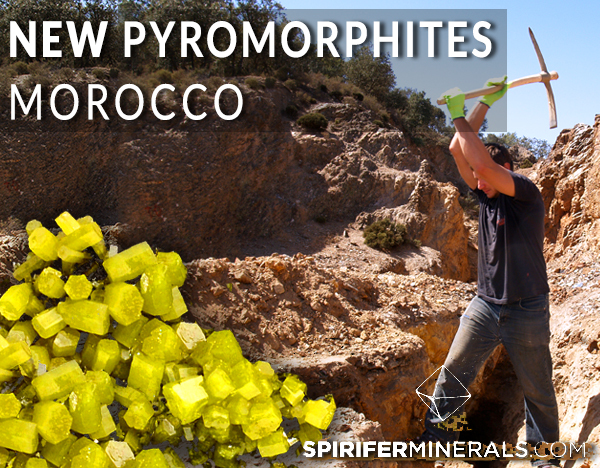 Re-discovery of an old location was the case of the „new“ pyromorphites from Bou Ibloulkhir mine near Moulay Bouazza, Morocco. 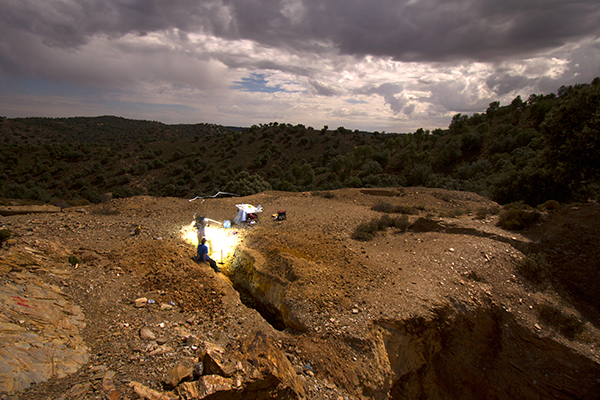 Author saw the first specimens from the location in the late 2014 shown as samples from an unspecified “new find”. At the begging of 2015 after investigation it became clear that specimens came from Khenifra area, which is not very rich in mineral occurrences. 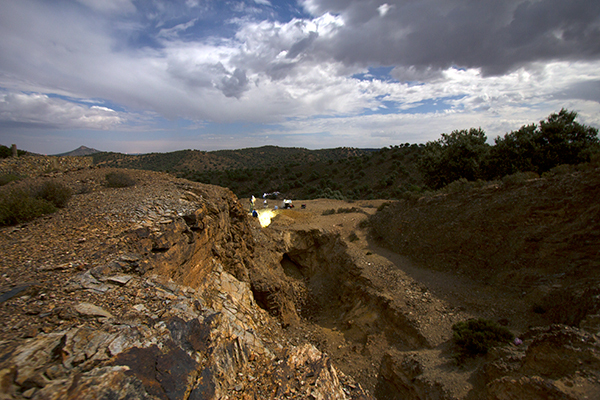 In the mid 2015 author finally confirmed the exact location and visited for the first time old workings of the Bou Iboulkhir mine located a few km East from Moulay Bouazza village. 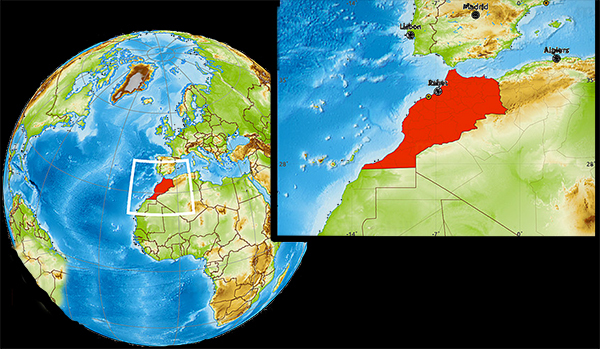 Map of Morocco with the Moulay Bouazza area marked. 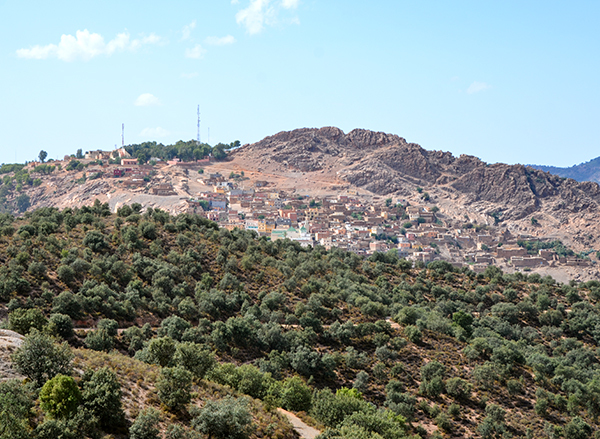 View to the Moulay Bouazza from the mine. M. Oleszczuk photo. 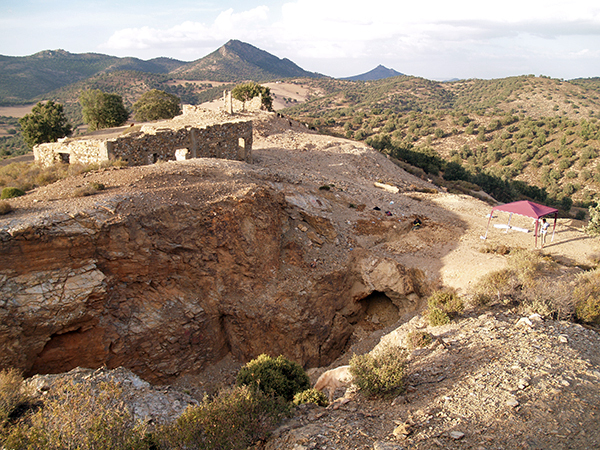 Bou Iboulkhir was an old French mine where galena used to be exploited as an ore of lead. In the 1960’s it was quite big operation with elongated quarry and tunnel placed on the main ore vein. Today whole area is abandoned, but mining remains are still well visible. Even the mine buildings are partly preserved. 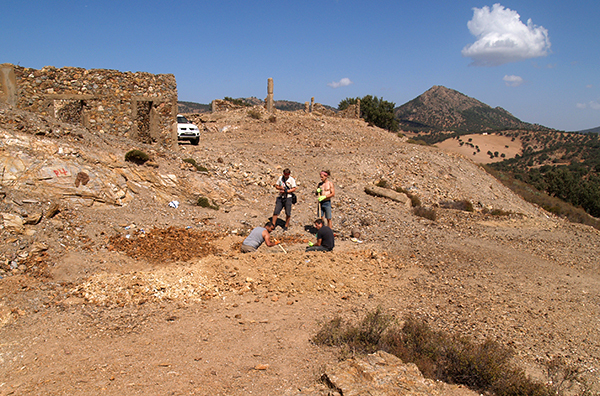 Mineralization in the Moulay Bouazza area is placed in Western Meseta, in Central Massif built mostly by Early Paleozoic and Carboniferous metamorphic and magmatic rocks. Mine is located very close to one of the Variscian shear zones and probably connected with intrusive rocks. 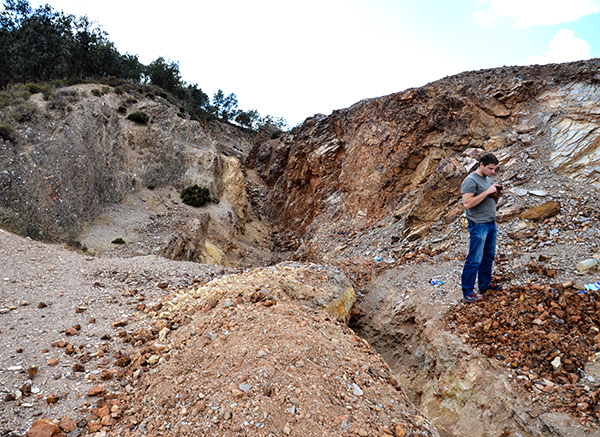 In Bou Iboulkhir host rocks for the ore vein are metamorphic schists of Carbonifeous age. 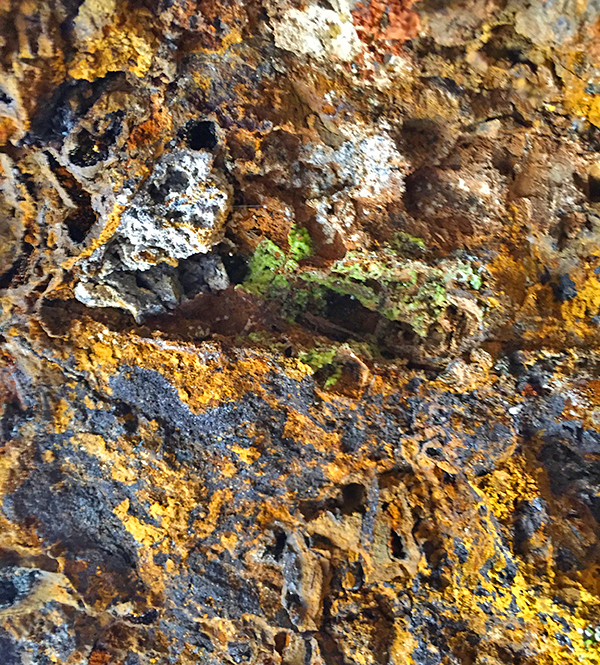 Main ore in the vein is galena which occurs as very coarse grains and bodies in gossan. Thickness of the vain on the surface is only about 30 cm, but it gets thicker (up to 50-70 cm) going down. Surficial part of the vein is weathered and galena occurs there in very porous gossans with many cavities and empty spaces. Most of the open spaces are filled with red clay, but some are very fresh and clean. 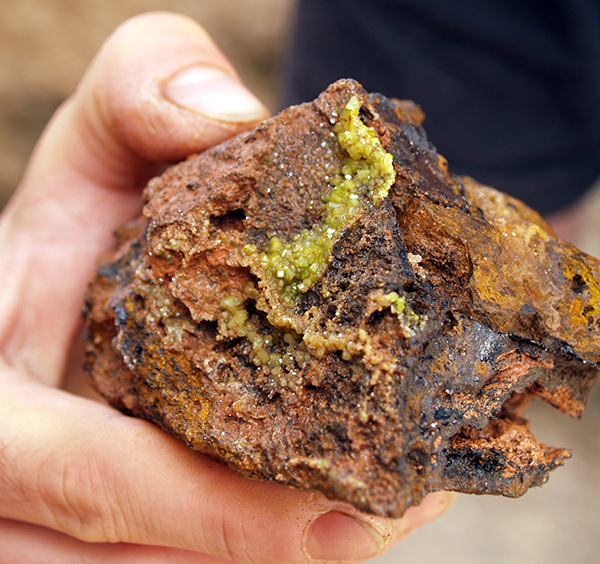 Only in small percentage of the cavities well formed crystals of pyromorphite are present. Usually they occur as groups of crystals with good separation, surrounded by “empty” part of the cavity. There are two types of matrix – one is red-brown gossan and second are velvet black coatings of the ?Mn-Fe-Oxides (not analyzed yet). Obviously second type of matrix gives much better contrast. Landscapes around the mining area with old mining buildings visible. J. Kołodziejczyk photo. 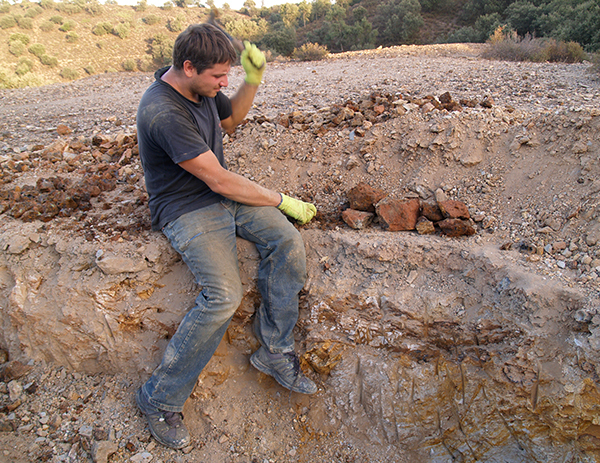 Satelitar view of the mining area with the main ore vein marked. Old working, mine`s buildings remains. J. Kołodziejczyk photo. Quarry on the main ore vein. M. Oleszczuk photo. Entrance to the old tunnel. J. Praszkier photo. Another entrance to the tunnel with the main ore marked. T. Praszkier photo. Close-up of the vein, galena bodies in the gossan. J. Praszkier photo. 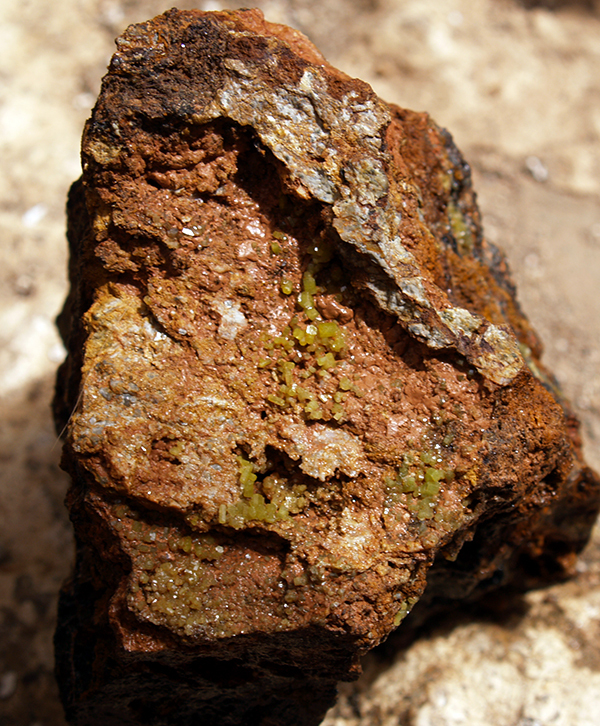 Porous gossans with a pocket containing green pyromorphite. T. Praszkier photo. When author visited the area for the first time only small surficial workings done by local miners were visible. Because vein reaches the surface (exactly is goes across of the old road) access to it is very easy. 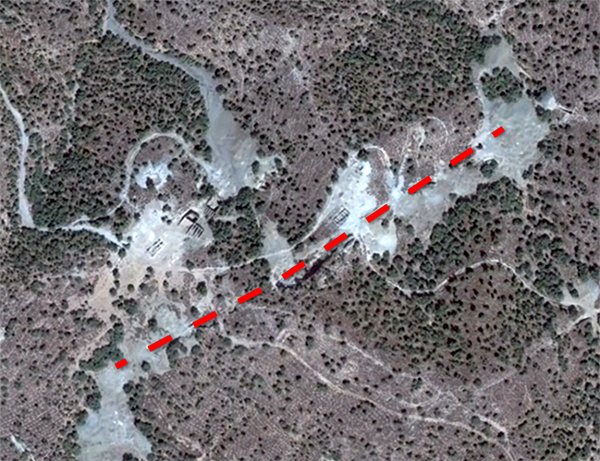 After short examination it became clear that location has a big potential and vein can be easily mined. A few months later small group of collectors and researchers from Poland arrived to the location to spend a week mining. 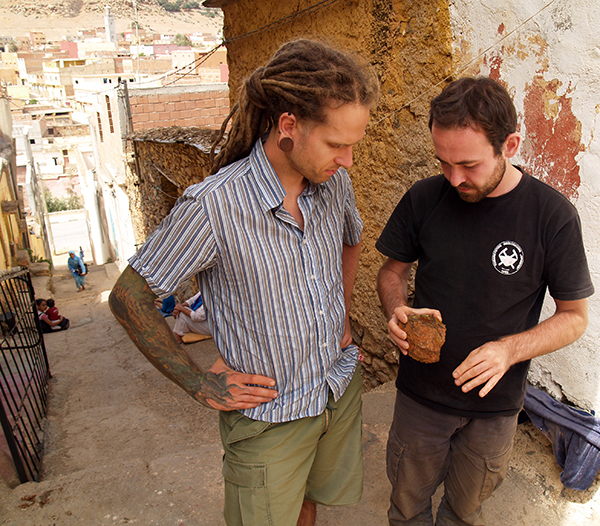 One of author’s friends – Adill from Midelt - was a major local help and arranged the accommodation and equipment. Because road to the mine is in bed shape and we had a lot of equipment (generator, jack hammers, tables etc etc) two 4WD cars were needed. Whole group slept in a rented house in the village and drove to the location every day. Moulay Bouazza area has a very specific climate, it is very hot there the whole year, so the best time to work are afternoons and evenings, or even nights. 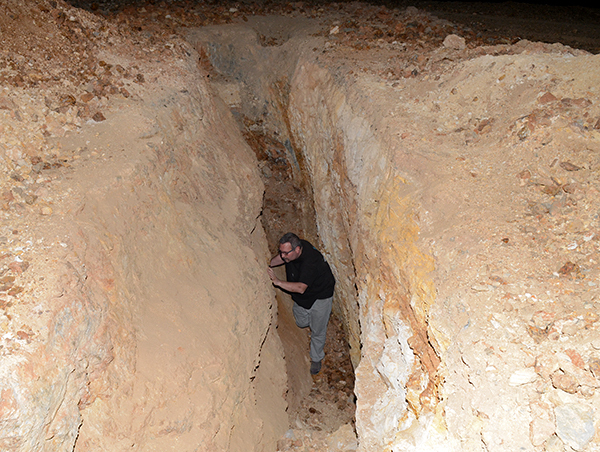 In a few days several meters of the vein were mined to the depth of 2 meters. All extracted blocks of the vein were broken into smaller pieces in search of cavities. 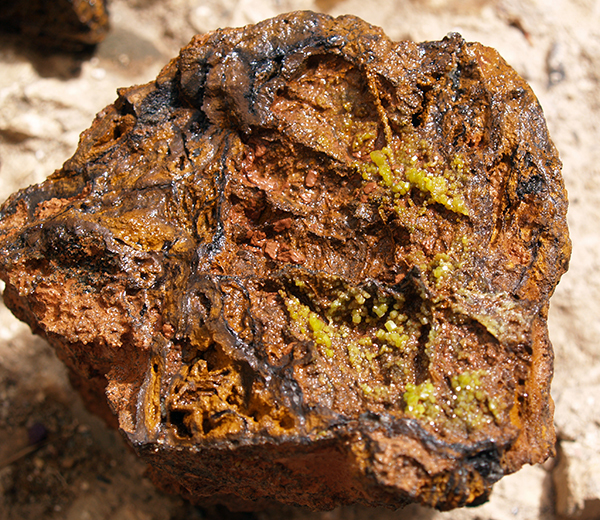 Because many cavities are filled with clay, the pyromorphite crystals are usually not well visible. For this reason all fragments of the vein with bigger pockets were taken to Poland to clean them and check their content. During the whole operation several hundreds of specimens were collected, mostly low or medium quality. A few higher quality pieces were also discovered. 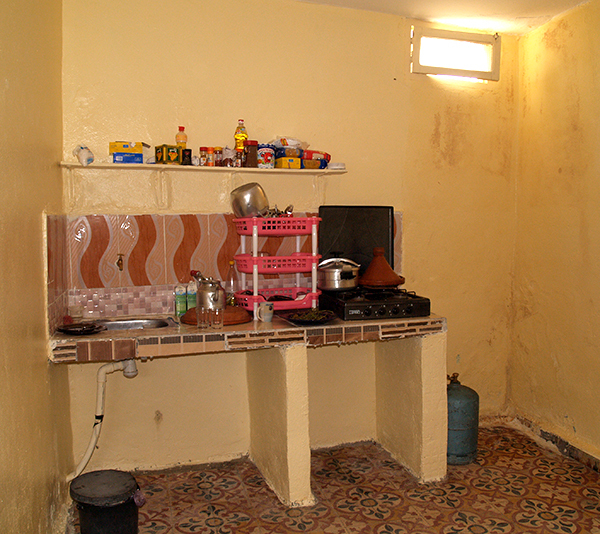 Kitchen in our luxury rental house in Moulay Bouazza. J. Kołodziejczyk photo. 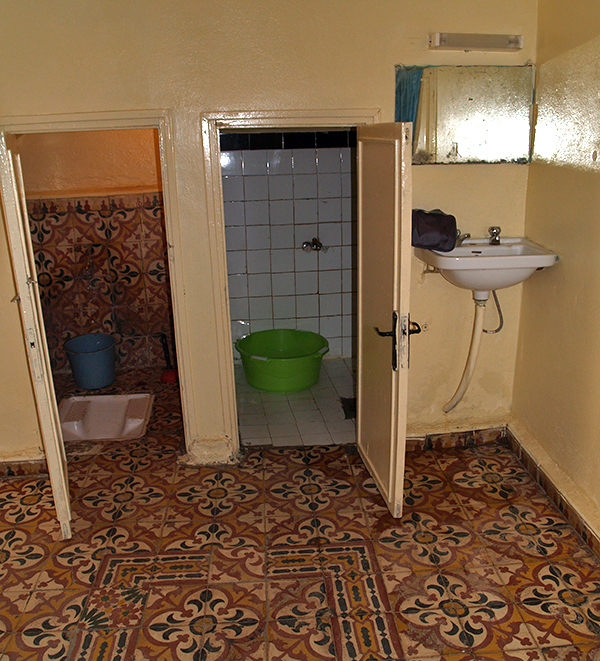 Toilet on the left, shower on the right, our rental house in Moulay Bouazza. J. Kołodziejczyk photo. Preparation for the mining. M. Oleszczuk photo. First research. T. Praszkier photo. Mining in progress, the very beginning. J. Kołodziejczyk photo. Digging the vein in a scoarching sun. M. Oleszczuk photo. Work in progress. J. Kołodziejczyk photo. Finally shadow in the evening, visible effects of a few days mining. J. Kołodziejczyk photo. Digging in the evening. M. Komorowski photo. 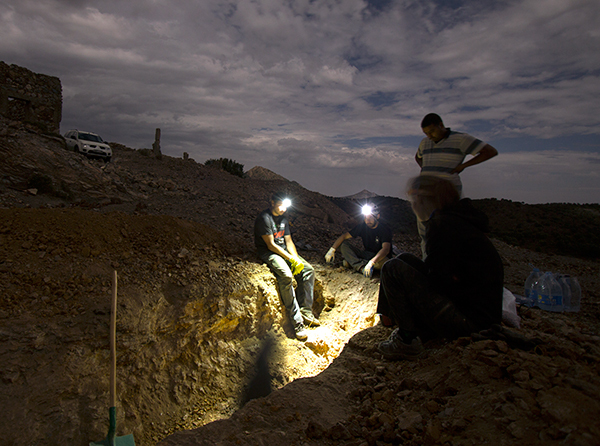 Eventually we worked even in the night, a few meters of the vein was mined at the end. J. Praszkier photo. We broke all the mined vein fragments into smaller pieces . J. Kołodziejczyk photo. Examining specimens after the first wash. J. Kołodziejczyk photo. Happy miner. J. Kołodziejczyk photo. It was not easy to see the crystals under a thick layer of red clay, this one is already after intensive first washing. J. Kołodziejczyk photo. One of the specimens after the first wash. J. Kołodziejczyk photo. Pyromorphite crystals are usually well formed as sharp hexagonal prisms with pinacoid faces, more or less elongated. Ratio between the two vary from 1:1 (prism:pinacoid) to 5:1. Usually smaller crystals have glossy and regular faces, and bigger crystals are more distorted, with parquet pattern as well as parallel and/or skeletal (hoppered) growth in some cases. Size of the crystals vary from less than 1 mm to about 2 cm, but in most cases crystals are 2-5 mm big. Luster vary from very good to medium. Color of the crystals is usually yellow and yellowish-green. In very few specimens vivid green color is observed. The only other minerals beside of pyromorphite occurring in pockets are rare and usually small crystals of cerussite formed as glossy, multiply twinned (snowflakes) crystals and white crusts of gypsum. One of the better quality speicmens, size approx. 7 cm. J. Praszkier photo. One of the better quality speicmens, size approx. 9 cm. J. Praszkier photo. One of the better quality speicmens, size approx. 6 cm. J. Praszkier photo. One of the better quality speicmens, FOV approx. 8 cm. J. Praszkier photo. One of the better quality speicmens, size approx. 5 cm. J. Praszkier photo. One of the better quality speicmens, size approx. 4 cm. J. Praszkier photo. One of the better quality speicmens, size approx. 8 cm. J. Praszkier photo. One of the better quality speicmens, size approx. 10 cm. J. Praszkier photo. Close-up of the specimen pictured above. J. Praszkier photo. One of the biggest crystals found in Moulay Bouazza, size approx. 2.5 cm. J. Praszkier photo. 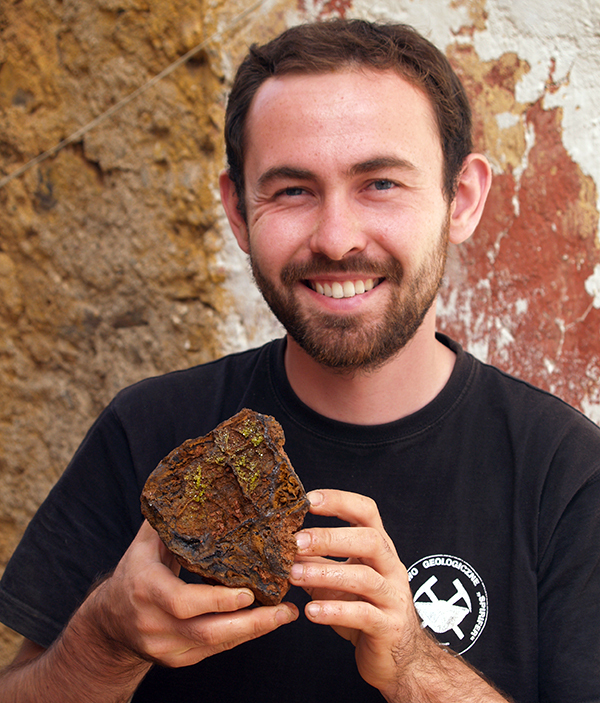 One of the best pieces recovered in Moulay Bouazza, crystals up to 1.5 cm. J. Praszkier photo. The best specimen collected in Moulay Bouazza in terms of color, it is more vivid in person. J. Praszkier photo. Probably the best piece collected in Moulay Bouazza, crystals up to 2 cm. J. Praszkier photo. Future potential of the location is probably still quite big. Local miners gave up after 2-3 visits when they had not managed to collect enough specimens. They use simple hand tools what makes exploitation very small and not effective. 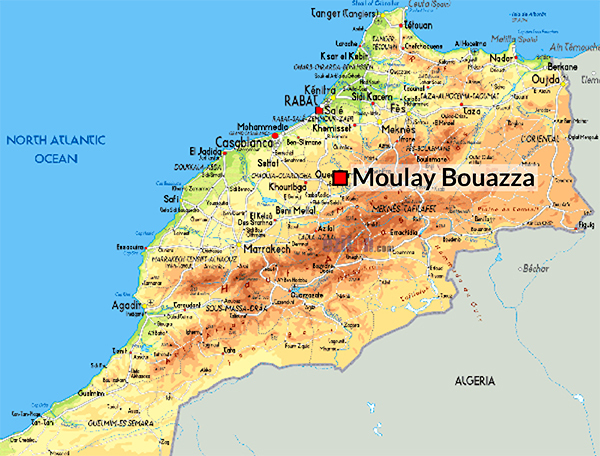 Probably in near future (for sure in 2016) another “polish expedition” to the Moulay Bouazza will be organized. 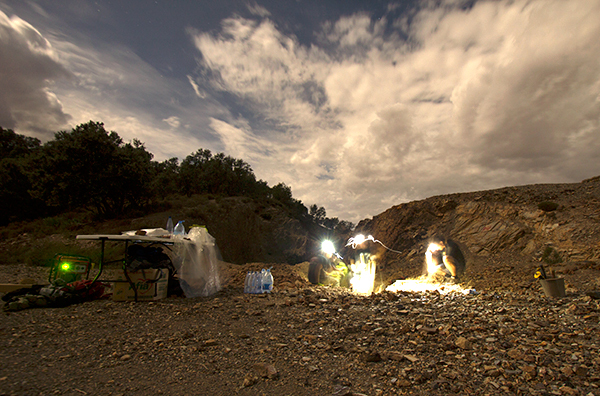 Night view to Moulay Bouazza from the mining area. J. Praszkier photo.